To save money and free up military choppers for combat operations, the U.S. military has paid contractors billions of dollars since 2008 to ferry soldiers and supplies around Afghanistan. But the Pentagon’s inspector general later discovered some exceedingly shady—and dangerous—behavior on the part of the contractors, according to a 2014 report that War Is Boring obtained through the Freedom of Information Act. The investigators found that some of the private helicopters were in disrepair, and the contractors flew troops without armored plates. The contractors painted their helicopters in military colors, against the Pentagon’s orders—potentially exposing their passengers to hostile fire. And we learned that a Colombian military firm once investigated by the Drug Enforcement Administration allegedly ripped off the U.S. military for thousands of dollars—while its employees sat in on sensitive briefings without proper security clearances. Three years ago, the Pentagon’s investigators launched their second audit of the Afghanistan Rotary Wing Transport program. Since 2008, the Pentagon has paid contractors through the program to transport soldiers and equipment in Afghanistan. Contractors in Afghanistan are not supposed to fight the enemy and typically fly their helicopters far from the shooting—though these companies still operate in war zones. So the U.S. military’s Central Command and Transportation Command demanded the contractors take various safety precautions. For instance, companies had to add armor to their helicopters and paint them in such a way—preferably white—that they would not be mistaken for official military aircraft. In 2010, the Pentagon’s headquarters for the Middle East and Central Asia began issuing contracts that required private choppers to have this extra armor. But American officers never ordered any modifications for deals it had previously made. Despite the clear threat from the Taliban, the unarmored transports already operating in the country went about their business. Some of those choppers had military-style paint jobs, too. “Five of the 13 aircraft without ballistic protection had paint schemes similar to military paint schemes, further increasing the risk of being targeted by the enemy and injuring aircrew and passengers,” the auditors pointed out. Even more worrisome, the Pentagon’s investigators found that Central Command and Transportation Command had essentially allowed the contractors to police … themselves. In Afghanistan, CENTCOM assigned just two officers to oversee helicopter operations at 11 sites across the country. TRANSCOM’s own contracting officer worked out of an office at Scott Air Force Base in Illinois—on the other side of the world from the fighting. “Oversight personnel relied on the contractors to self-report … aircraft flight status,” the investigators found. This led to serious safety problems. The Pentagon was only supposed to pay for choppers that were ready to fly. The auditors determined one Colombian contractor—Vertical de Aviación—overcharged American authorities more than $140,000. The Pentagon’s watchdog wasn’t sure whether this was the only instance when officials overpaid for private contractor flights. We don’t know if the Pentagon’s investigators were aware of it, but they would have had good reason to be wary of the Bogota-based contractor. In two January 2010 diplomatic cables published by WikiLeaks, U.S. federal law enforcement agents suspected the company—formerly known as Helitaxi—and its owner of having ties with money launderers and drug traffickers. The company has been in business since 1982. Helitaxi changed its name to Vertical de Aviación in 2002, according to the cables. The diplomats described the company as one of three allegedly “Colombian cartel-related air transportation companies” that “was once taken over by authorities because it was created with monies coming from the drug trade,” a second cable from the Office of the Secretary of State noted. Carlos Alberto Plata Gomez, an oil industry analyst, gave the names of other frontmen and money launderers: -- Byron Lopez Salazar; owner of Helitaxi, a company that rents the services of helicopters. Plata described Lopez as the biggest money launderer in Colombia, laundering money up to USD five billion for the cartel, many other narco groups (including the remnants of the Medellin cartel), and emerald miners/dealers. The company denied the allegations when they later surfaced in the Colombian press. “You do not know what it means to collect or bring food to the soldiers in the middle of the Colombian jungle,” Vertical de Aviación vice president Juan Carlos Lozano told El Espectador in 2011. The embassy’s diplomats noted that they learned of the DEA investigations after consulting with Blue Lantern, the State Department agency that monitors the legality of weapons and equipment transfers falling under the so-called U.S. Munitions List. Vertical de Aviación sought “unclassified defense articles and technical data in support of the government of Colombia’s illicit crop eradication program, through fixed and rotary wing aircraft operations, maintenance, training, and logistics support,” the second diplomatic cable stated. “In light of this information, Post does not recommend issuance of a license to Vertical de Aviación to import goods on the U.S. Munitions List,” the first cable recommended. The company also worked in Afghanistan. But it shouldn’t have, as none of the company’s employees had clearances for their duties in the country. To obtain the necessary clearances, the contractor would have needed an office somewhere inside the United States. “Although Vertical de Aviación site managers possessed personnel security clearances because of other responsibilities (such as being members of the Military Reserves) their security clearances were not valid for work performed in support of Vertical de Aviación’s ARWT contract,” the inspector general reported. The IG stressed that an individual contractor having a clearance did not mean the clearance was applicable or valid in this case. Despite not having authorization, the company’s site managers regularly sat in on classified briefings about enemy threats and ongoing American operations. The Pentagon watchdog also found that American troops posted restricted flight schedules in public places. “We observed that military personnel had posted SECRET flight information that identified the flight routes, departure times, and passenger information from the classified flight schedule on doors in two public locations,” the investigators revealed. On top of that, “the staff sergeant who posted the classified information in public locations stated that it was common practice to post classified flight schedules outside his office front door,” the IG reported. Needless to say, this sort of information could be of great utility to insurgents. In Afghanistan, so-called insider attacks have resulted in the deaths of dozens of Americans, Afghans and NATO allies. In light of all of these issues, the Pentagon watchdog issued a number of recommendations. First, the auditors wanted TRANSCOM to try and get their money back from Vertical de Aviación, and they wanted CENTCOM to fix the safety problems and plug the security leaks. “All these recommendations are still open,” the Inspector General confirmed to War Is Boring earlier in March. American officers did get the classified schedules taken down, according to the IG’s report. The officers “completed a security review resulting in the removal of flight schedules from unclassified Websites,” CENTCOM’s statement added. Vertical de Aviación also installed extra armor plates on its helicopters, and continued to operate in Afghanistan until the firm’s contract ran out. But the company doesn’t appear to have ever obtained valid security clearances. “The contract for Vertical de Aviación’s services expired in November 2013 and mission requirements did not justify its renewal,” CENTCOM noted. TRANSCOM’s public affairs office did not respond to a request for comment. 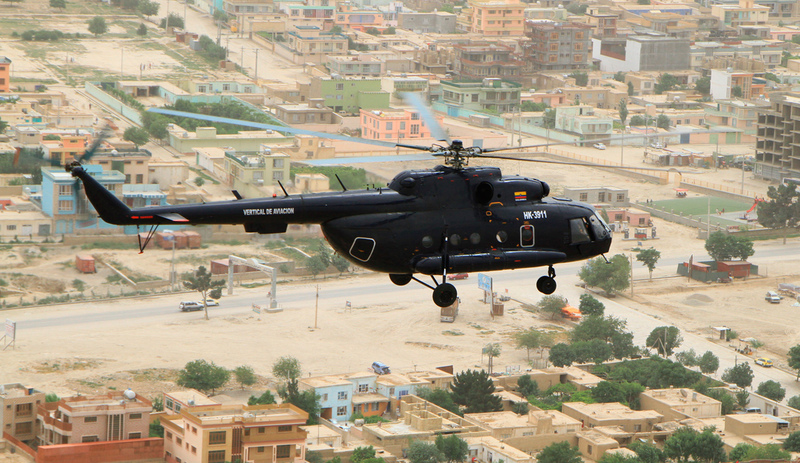 The release included a picture of one of the company’s Mi-171 helicopters. The chopper is painted black, rather than the Pentagon’s preferred white. However, we don’t know if this photo was taken in Afghanistan. The PR notice concluded with a letter from Air Mobility Command—the U.S. Air Force’s portion of TRANSCOM.